Seattle has over 90 unique neighborhoods. 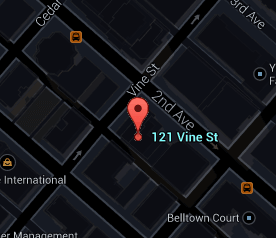 The location of Arbor Place is in the area known as Belltown. Platted in the early 1860s, Belltown is a neighborhood where a number of upscale restaurants and clubs have established a brisk trade in the area such as El Gaucho and The Crocodile. If you want to shop step into Cost Plus World Market or if you are in the mood for sweets, check out Seattle's ultimate Yellow Leaf Cupcake Co.
Every building has its own personality and attributes. The community is an important aspect of city living and can have an impact on how integrated it is with the residences. The Arbor Place building features can be explored here. A full list of amenities within the complex is displayed to help understand the offerings of the project. Sitting between 1st and 2nd Avenues in Belltown, Arbor Place Tower was constructed in 1989 as luxury apartments. Shortly after its construction Intracorp converted the building to condominiums. This 26 story building boast 158 residential units plus 7-stories of Class A office and plaza retail. The building has some of the finest amenities in town including a secure lobby entrance, indoor pool, hot tub, fitness center and community room. The success of this building belongs to the companies involved in its construction TMA Architects, McCarthy Building Companies, consulting civil and structural engineers ABKJ, and popular resort development company Intrawest. All active, contingent, pending, and sold listings for the Arbor Place building. The Stroupe Group specializes in downtown Seattle condominiums. All the articles that have been published by the Stroupe Group concerning Arbor Place and Belltown can be found here.